You don't need to buy everything in your bathroom for it to look amazing. In fact, you can use DIY projects, big and small, to really make your bathroom your own. Whether it's vanity that fits just right, or a handmade faux-marble countertop, or even just a hand-sewn shower curtain, there are lots of ideas out there on how to use your creativity to personalize your space. Above, a simple DIY project you can do with the empty space at the top of a vanity to insert a toilet paper holder. It has the sleekness of a hotel room and puts the toilet paper roll out of sight if you're not sitting on the toilet. 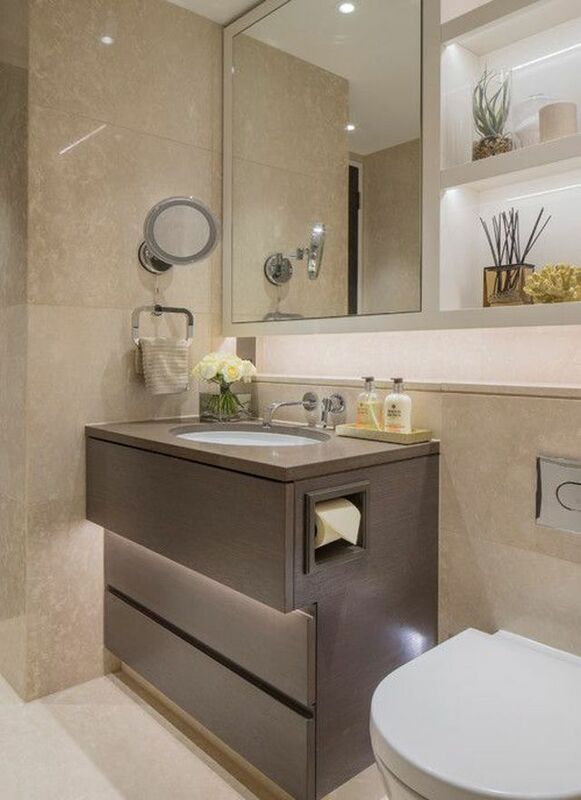 This bathroom was designed by Folio Design. If you prefer the open, industrial style sink space, you don't need to spend a lot of money. Just get a couple of lengths of copper tubing, spray paint it whichever color you like (here in gold), and install it safely as legs for your sink. This white and gold bathroom by Lovely Indeed also features gold-colored hardware, set on a white background, to harmonize the whole. If you drive long enough in any town, you'll eventually find some empty, abandoned pallets somewhere. Pallet wood is conveniently set into easy-to-use planks, that you can separate and put back together at will. Deconstruction isn't just for food. This industrial bathroom by from ​[in] form exposes the underside of the sink and uses reclaimed wood to build a counter around it. The use of two copper pipes to mix the hot and cold water also exposes the "innards" of this bathroom: yes, they do come from separate pipes. The genius of this bathroom by Erin Martin Design is that it integrates DIY elements as if they were exclusive designer items. The light fixtures are made out of a large piece of wood with several branching directions. A lightbulb was added at each end, while the wiring is laid out inside the hollowed-out wood. This rather original bathroom, found on DIY & Crafts Ideas Magazine, features a group of tree stumps seemingly strewn around. Of course, pipes run through the faucet and under the sink, but the design is so stunning that you don't even think about that. All that was needed here was to replace the top with a bathroom-friendly countertop material and add the two sinks and piping. Since the outside part of a shower curtain is usually protected by an inner liner, you can be creative with your fabrics. All you need is enough length (in this case, a few sheets) and a few sewing skills. Mason jars can be used for literally anything, including these gorgeous light sconces. This rustic bathroom by Robb Restyle features two bright, blue-shaded light sconces that just add a perfect amount of whimsy to the space. The page gives a tutorial for those who might be interested in trying this project. Try different staining colors for the glass: pink, yellow or green would be great depending on your space. Are you or someone you know a mural artist? Then get inspired by this gorgeous DIY comic art in this attic kids' bathroom, by London Basement. The bubbles on the wall continue onto the side of the tub, and the white wall makes every bright color pop. If you have no painting talent, you could use wall decals for a similar effect. Add a taste of beachside vintage to your bathroom with this great DIY idea: shiplap wainscoting in faded white, topped with beach-related decoration. This beach bathroom by DIY Diva also features a gorgeous river rock shower trim and hickory hardwood floors. Shiplap wall paneling is fairly easy to install and can be modified to suit the space and your decor style. Never leave the bathroom for clean towels again with this easy DIY open shelf by Remodelaholic. If this one looks too rustic for you, you can always paint or stain the wood before building the shelf. That's the beauty of DIY projects: you can modify them however you like to suit your own style and ideas. Well, okay, the mirror itself isn't DIY but the way it hands off a jute rope is. This bathroom by Whitney Lyons has a touch of nautical-inspired rustic, thanks to the thick rope holding the mirror in place. Making holes in a mirror takes some skill, but once you know what you're doing, you can easily make your own similar project. This beautiful contemporary bathroom by A Beautiful Mess features an easy DIY project: a copper and leather makeup organizer. The organizer can be modified and used in any room: for small utensils in the kitchen, for hanging plants in the living room or bedroom, and of course in the bathroom. The bright copper adds some glam, and is reused throughout the bathroom on the sconce and the sink hardware. Smart!